by Antonio on 24/03/2015 13:13. Last edit by Joao on 22/09/2015 15:30. Auto Rent has established a partnership with a car rental company in Porto Airport (OPO) to provide car hire services to our clients. In the near future Porto Airport location will be available in our booking engine. Meanhwile you can go to www.oporent.com and book directly with them. by Antonio on 09/07/2014 15:25. Last edit by Mark on 06/08/2015 11:30. We're happy to announce that you can now purchase tickets for the Algarve's best theme parks with Travelgarve! Travelgarve is our attraction sales company, and you can now purchase your tickets online at www.travelgarve.com, and you can use the discount codes below to get a special offer! For Zoomarine enter promotional code ZMREN10 for a 10% discount on your ticket. For Slide and Splash enter promotional code SLDEN10 for a 10% discount on your ticket. For Aquashow, enter promotional code AQSEN10 for a 10% discount on your ticket. And that is just because you visited the Auto Rent website! If you rent a car on our website, you will get even bigger discounts in your confirmation letter! 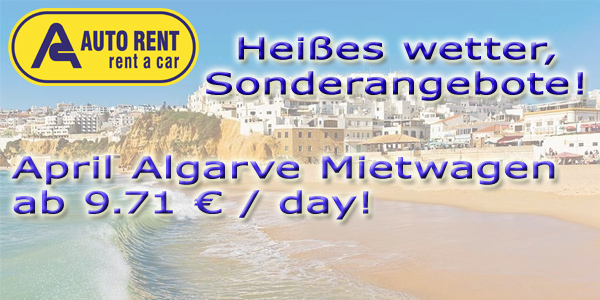 So book now for great deals on car hire and theme parks in the Algarve! And keep an eye on our website and on Travelgarve for more promotions! by Joao on 17/04/2014 12:31. Last edit by Mark on 06/08/2015 10:37.